YOH BABES AND HUNKS AND I AM BACK ! *See see, I didn't disappoint you all right?! LOL. 1st, I am back in SG and 2nd, I am back blogging ! Before I went to Malaysia, I went for an appointment with I*CON Shunji Matsuo by Lily Xu at FEP! Yay, and Simon is SO SO SO gonna be MY hairstylist manxzxz !!! *not gonna be selfish so lets SHARE him ! LOL. Sounds so wrong ! Seriously speaking this is my very very 1st time walking into a salon without preparing a sketch of the hairstyle I want or even an idea on how I want my hair to turn out to be ! So I went in then I was told that Simon will be doing my hair that day and I sat down with a freaking uneasy face -____- , but Simon's really good at breaking the ice can? Hahaha. Then he went on talking about my hair, asking me when I last dyed my hair and cut my hair to determine my hair's condition on the spot and they called that "consultation" ! Simon's really cute la! ^^ Hehe. I asked him, can take picture? He say can and went on to smile for my camera! Their "consultation" is free of course, but he has his own FEEL about hair as he told me he like to cut as the feel that your hair brings and of course, to suit the shape of your face ! Ok, then he decided to change my hair colour to a healthier looking colour. Simon isn't a supporter of bleaching, so he seldom bleach people's hair. He also told me that once our hair is bleached, our hair loses its natural radiance and shine. still achieving the MAGAZINE look which I like ! Simon even recommends what kind of colour suits you and your new hair style! So you will be all geared up to be a confident and pretty girl to make people envy you! I get a hair sponsor (that is good of course). LOL. Although it's quite pricey to cut & dye your hair there but I think it's really worth every cent paid. Very very proffesional hair service that, I feel, will make everyone walk out with a smile. Also also, this place really suits me as they really understand Japanese style very well, I believe from J-POP to office fashion or even house wife style, all can be done at I*CON Shunji Matsuo by Lily Xu at FEP. No worries! No harm will be done! Find Simon! He advices you to protect your hair ! *Pardon my toilet bowl T-T Super unglam but I changed in the toilet ! ALL THE MORE this place is for YOU ! Book an Appointment with SIMON today ! 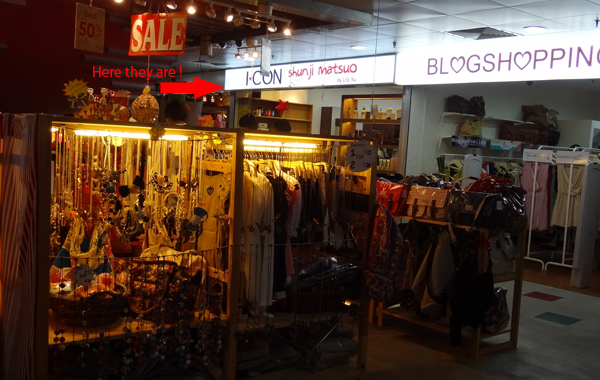 They are located at the 1st floor of Far East Plaza. *if you want pretty hair, don't spoil it in the hands of the unprofessionals. So VISIT I*CON Shunji Matsuo by Lily Xu everytime you want your hair done ! *recommended stylist is Simon ! Thank you all ! Hope you all have a nice time there ! How much did you pay to do this hair? How did u keep yourself fair?!!! This person is stealing your pictures Kiyomi Lim! !